“Do not despair: one of the thieves was saved. 44 It was now about the sixth hour, and there was darkness over the whole land until the ninth hour, 45 while the sun’s light failed. And the curtain of the temple was torn in two. 46 Then Jesus, calling out with a loud voice, said, “Father, into your hands I commit my spirit!” And having said this he breathed his last. It makes me think of Jesus crucified between two thieves and surrounded by wild and crazy mob. From now on, when you hear that song, you will think of this story from Luke 23 because Inception. Just as many people are confused about the singer of that song, many people are confused about the savior in this story. Throughout Luke’s Gospel, Jesus has been portrayed as the Savior of the world who welcomes sinners, shows them mercy, forgives them, and grants them new life. Let’s see if he is willing and able to do this for an extreme case, for a man in dire straits, suspended between heaven and hell. The man was an ordinary, common, Jewish man. Like all male Jews he was circumcised according to the Law of God. As he grew up he became aware of the Law of God and the religious customs of his people. Things like that were in the drinking water, part and parcel of the Jewish social structure. That’s akin to our growing up in the Bible Belt, or “the Jesus-haunted South” as Flanner O’Connor put it. He was probably exposed to the preaching and teaching of John the Baptist at some point in his life. Almost everyone knew about John, the eccentric prophet. It is possible that he was baptized by John the Baptist. The Gospel writers record that “Jerusalem and all Judea and all the region about the Jordan were going out to him, and they were baptized by him at the river Jordan, confessing their sins.” So there is a chance that this robber was baptized in the Jordan. If so, it might have been sorta like Delmar’s baptism in O Brother Where Art Thou? Remember how the preacher washed his sins away — even that Piggly Wiggly he knocked over in Yazoo. All things considered, he might have seen a miracle performed or heard a sermon delivered by Jesus. After all, he was aware that Jesus had something to do with a kingdom! More than likely, the robber came from a poor family. Maybe he grew up in the projects. Maybe he suffered from father-hunger. Maybe he just fell in with the wrong crowd. Whatever the case, we know he became a lawbreaker — a dangerous criminal who stole by using violence and force. No one knows how long his life of crime lasted. Months, years, weeks. But we do know that he was caught, tried, and convicted. Whatever his specific actions, they were capital crimes, and he was sentenced to death for them. Unfortunately, we meet him at the very end of his life. By the time we catch up with him he has reached the end of death row. In fact, we meet him just a few hours before his death by execution. He wasted his life stealing, destroying, terrorizing. He had been playing with fire for many years, and when you play with fire eventually you get burned. Do the Crime; Do the Time. And all that jazz. Near the city of Jerusalem, just outside the gates at a place called “The Skull,” this ordinary, common, Jewish man was crucified along with two other men. One was a criminal (perhaps a partner in crime) but the other was different. Some called him a political revolutionary. An enemy of the State. They said he claimed to be the King of the Jews. He was the one on the cross in the middle. The one the Jewish leaders, Roman soldiers, and the crowd all took turns insulting and mocking. Even the other thief chimed. Adding insult to injury, he shamelessly mocked and scoffed Jesus without mercy. Like the others, he piled it on thick and heavy. One blasphemous word after another. They say “misery loves company” but perhaps he just wanted the crowds to look away from him. Maybe he wanted someone to sympathize with him for a brief moment. Maybe he was afraid that if he did not join in with the crowds they would turn and heap insults on him. 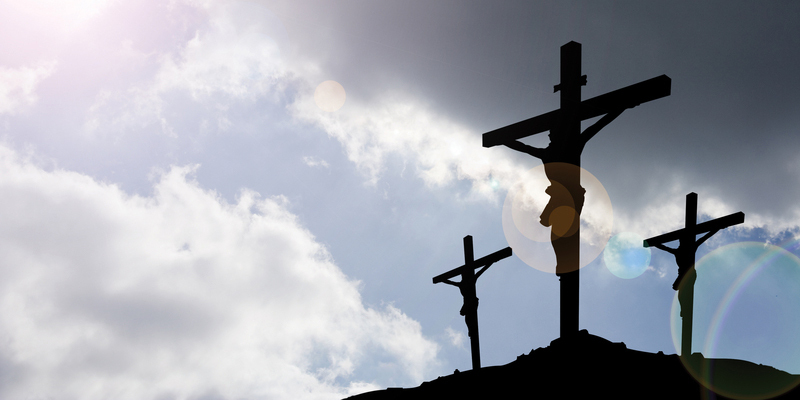 Meanwhile, the first robber we met found himself suspended on a cross somewhere between life and death. As a Jewish man living in Roman occupied Judea he knew the process of crucifixion. The joint dislocating strain, the short gasps for breath, the delirium, the elements—weather, insects, glaring sun, cold wind—unquenchable thirst. Sweat burned eyes. In the end, broken shin bones, gasping for breath, intense pain, then death. This could go on for hours — even days. Either way, it would end the same way. He would lose consciousness and fade to black. He was literally supended between heaven and hell. In that moment, he took inventory of his own life, and the consequences of his own sins, and the punishments that awaited him in the afterlife. Barring a last minute miracle, he would suffer death and pass into Hades (Greek), into Sheol (Hebrew), the realm of darkness and death. Unlike the other robber, he knew how this was going end. An instant after death he would meet the true and living God and face judgment and be sentenced to Hell. He felt it in his bones. He feared it in his soul. While the other robber shouted a barrage of insults; then, a cynical prayer: Are you not the Christ? Save yourself and us! The gravity of the situation weighed on the first robber. Realizing that he was guilty of sin and deserving of punishment, and feeling that he was just a few breaths away from an even worse torment — seeing that he had been playing with fire even in the jaws of death, he turned and rebuked the other criminal. Don’t you fear God, since you are under the same sentence of condemnation?! Truly, we are condemned justly…but this man has done nothing wrong. Deep inside him something changed: his pride melted, his heart broke, his spirit yielded. Then he did the unthinkable, the unexpected. In an act of devil-may-care reckless self-abandonment, he made a last ditch, here-goes-nuttin, death-bed confession from the heart. He confessed that he was a guilty sinner — his punishment was right, good, and fair — the due reward for his deeds. He confessed that Jesus an innocent saint — this man has done nothing wrong. Then, in a final act of desperation, the robber asked the impossible. Hope against hope, he offered up a heart-felt prayer that was heard at the cross, around the world, and in heaven at the throne of grace. What would Jesus do for a sinful, lawbreaking, hardened criminal? What would Jesus do for the man who also spent the last two or three hours insulting, cursing, and mocking him? What would Jesus do for a frantic, desperate sinner, praying for mercy on his way to death and hell? Jesus would do the impossible. With these words, Jesus proclaimed good news to the poor, liberty to the captive, recovery of life for the dead, freedom for the oppressed. The dying thief found favor in the eyes of the Lord! For what is not possible with men is possible with God. Nothing is impossible with God. Without a moment’s hesitation, Jesus took upon himself all the robber’s sins and all the punishments he deserved. There was no hatred, animosity, or wrath in Jesus’ eyes. Just tender mercy and undying love. 44 It was now about the sixth hour, and there was darkness over the whole land until the ninth hour, 45 while the sun’s light failed …46 Then Jesus, calling out with a loud voice, said, “Father, into your hands I commit my spirit!” And having said this he breathed his last. I wonder what the robber thought — and how he felt — when Jesus died. I wonder if he doubted Jesus’ promise even a little. Did his death mean he would not come in his kingdom? Did it mean he would come in his kingdom after death? Did it mean his kingdom was a myth? The robber would find out soon enough. As evening fell a soldier appeared, standing before him, grasping a short hard-wood club. After a brief pause, he swings hard. Twice. It won’t be long now. A few more tears, a few last groans and gasps, a final fade to black. Jesus snatched the robber from the flames and saved him by mercy. That day, he appeared before the gates of Paradise, smelling like smoke, and singed around the edges. By the power of God’s grace and mercy, he walked into the kingdom of Jesus Christ, his Lord and Savior and King. And Jesus welcomed him home. We often say there is power in prayer, or the prayer of a righteous man availeth much. But here we see that the Heart-felt Prayer of a Penitent Sinner is powerful and effective. Why? Only because the object of the prayer! Such prayer is powerful nd effective only because the faithful Heart of the Savior who hears the prayer is so mighty to save. Ask for salvation, and it will be given. Seek forgiveness, and you will find. Knock on heaven’s door, and it will be opened. Jesus heard the thief, remembered his prayer, and granted his request. He will do the same for you if you ask him by faith. The old gospel says Jesus receives sinners who believe him! He welcomes them by grace through faith into his kingdom. Jesus saved the thief on the cross by grace through faith in Christ alone. This is not an exception to the rule — it is the rule! The dying thief was saved the same way any sinner — including you — is saved. This story is good news for everyone — especially those who know they are suspended between heaven and hell. Do not despair: one of the thieves was saved. Do not presume: one of the thieves was damned. If you think you are too far gone, out of reach, and cannot be saved, remember the way Jesus showed mercy to the thief on the cross. If you think you are safe and secure as you are — and that you have have no need of Christ, remember the way Jesus let one thief perish in his sins. The one who was damned prayed, Not thy will, but mine. The one who was saved prayed, Not my will, but Thine. What will your prayer be?